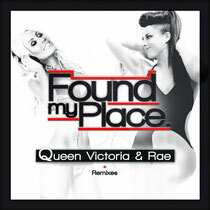 Singer, songwriter, producer and remixer, Rae, teams up with Australian artist Queen Victoria to collaborate on her latest release, ‘Found My Place’, a track with big breaks, big riffs, and most importantly, a big bassline. Rae has also supplied a remix of the original, which adds to her blossoming production skills. Rae has already released a string of hits on Defected, produced with Sandy Rivera, been championed by BBC Radio 1’s Dance Anthems host, Danny Howard, and hit a #1 on the Traxsource chart. Outside the studio she’s creating a buzz with her unique live show. She was the first lady to rock the crowd at Ibiza venue Ushuaia, is part of Pacha’s worldwide tours, which included an appearance on B@TV, that introduced not just her DJing abilities but her vocal prowess to a whole new audience, all adding to her growing fan base. ‘Found My Place’ is out today, check it out below.